This is supposed to be for the Bake-Along for baked pasta. But I was too tight up with my work that unable to post it in time for it. I have baked something similar to this one previously. 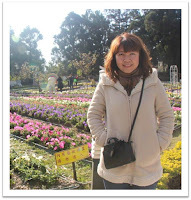 It was Baked Pork Chop with Rice and adapted from Lena’s blog too. 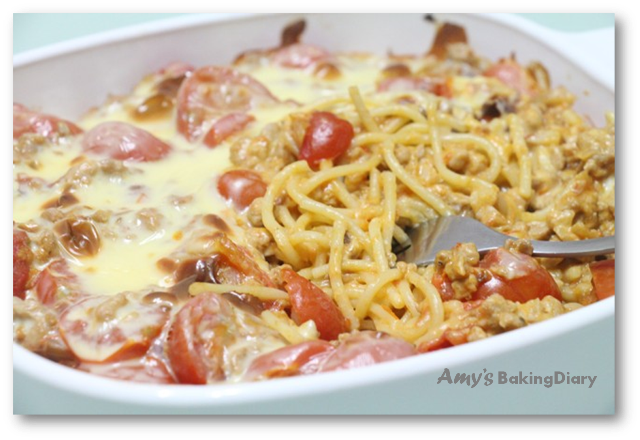 Be it whether Baked Rice or Baked Spaghetti, this is the type of dish which I cook regularly for lunch on weekend when my boys and I are too lazy to leave house for lunch. So I’ll cook whatever it is available in the fridge and mince meat (both beef and pork) and cheese are always available in my fridge. 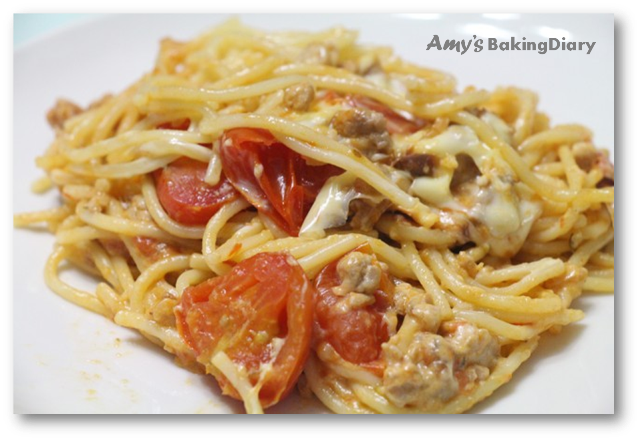 This is an easy and fast dish which is well received by my family. 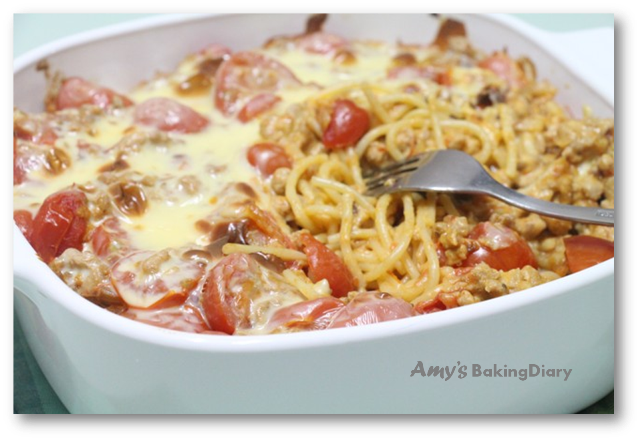 (1)Cook the spaghetti, drain and transfer to a baking dish. Heat up some oil in a frying pan, cook the onions and garlic till sizzling and add in the ground pork. 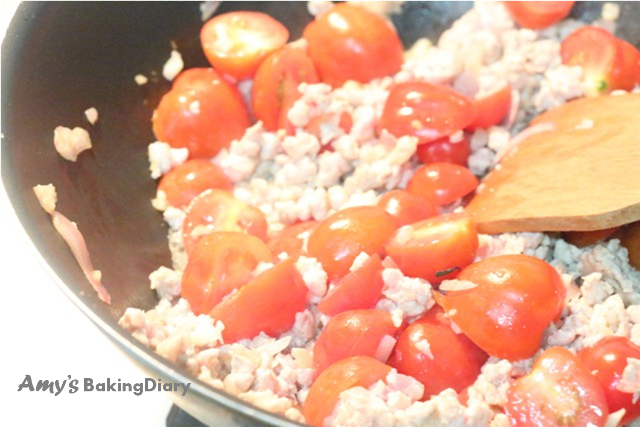 Stir and cook the meat till almost done and add in the cheery tomatoes. 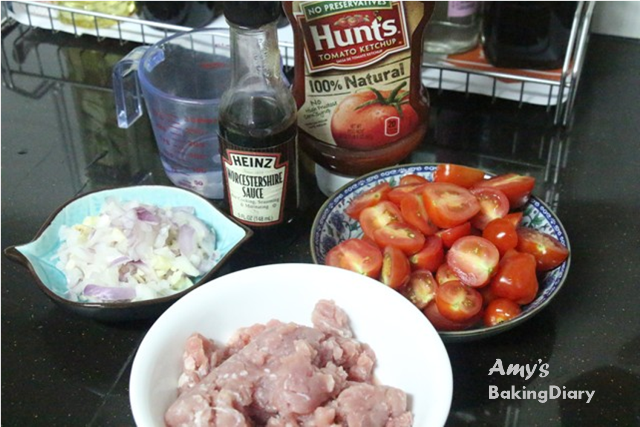 (2)Pour in the sauce and let the sauce simmer for about 2 minutes, can mash the tomatoes a bit. Season with salt if necessary. Remove from heat. 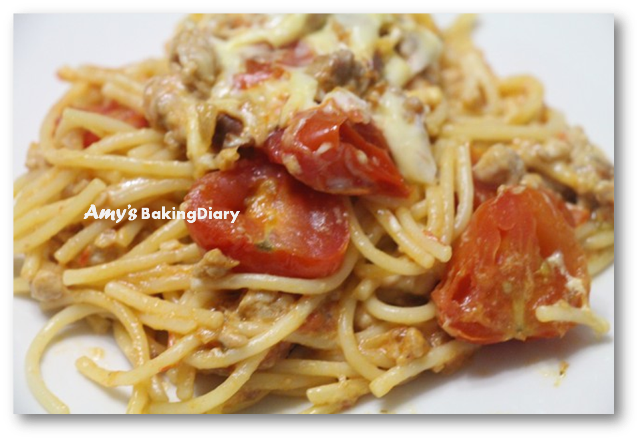 (3)Pour the sauce over the spaghetti and scatter the cheese all over. Grill on a preheated oven at 210ºC for about 10 minutes or till the cheese is brown. 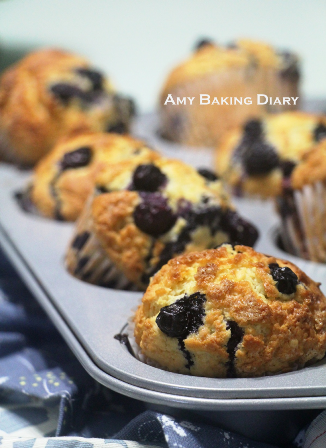 No worries if you miss linking this post with us at bake-along. We are always cooking and baking along anyway...Can totally understand the frustration of keeping with timeline... No stress, lah!! !